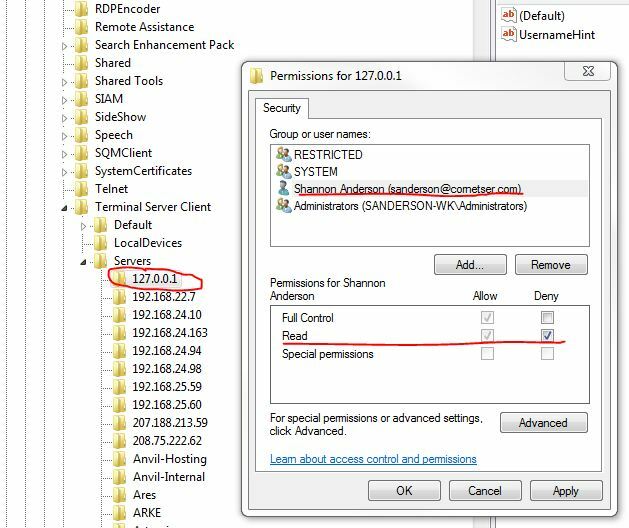 Who has not started a RDP session to a Windows 2008 Server or Windows 7 system and had the previous domain credentials popup as the default login for the next system you touch. Well if you are like me and touch many different customers each day then you have no doubt had the login for your Windows 2008 terminal session show the log on of the previous domain that your were logged in to. This can be a big pain in the “arse” if you know what I mean. Right click and select permissions on the 127.0.0.1 folder then set permissions to deny yourself read access to it. As soon as you do this, you should start seeing the right domain name when opening a terminal session to Windows 2008 servers or Windows 7 workstations.